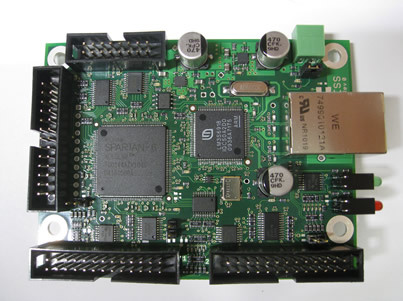 The Ethernet SmoothStepper requires an external 5V DC power supply. The power can be supplied via the green power-in terminal block or via pin 26 of any of the Port headers. Please make sure your polarity is correct BEFORE you turn the power on! You will not need a special Ethernet cable. A crossover or straight cable will work fine. The cable may be shielded or not. Since cables are so inexpensive, it is better to use a shielded CAT6 cable, but an unshielded CAT5 cable will also work fine. The SmoothStepper may be connected to an Ethernet switch or you may directly connect it to the Ethernet port of the PC. It is recommend that the SmoothStepper be on its own private network, but it may work OK with light Internet traffic on the same net. If your computer has only one Ethernet port, you may want to purchase a USB to Ethernet adapter and run the Internet on the USB port. That way all of the machine control will be on its own private network. Make a copy of your current XML (profile) file, just in case something goes wrong. The XML files are located in the c:\Mach3 directory and have extensions ending in ".xml". If you are launching Mach from a shortcut on your desktop, the profile is specified in the shortcut. The SmoothStepper has certain parameters of its own that are unique to it. The plugin creates a new section in the XML using the name of the device. In the case of the USB SmoothStepper, the name is "SmoothStepper". For the Ethernet SmoothStepper, the name is "ESS". If you are upgrading from a USB to an Ethernet, you must re-enter all your settings. Here is a link to the latest Ethernet SS plugin. Open the zip file and double-click the m3p file. Scroll down to the operating system you are using. By default it will show a Subnet mask of 255.0.0.0 after you type in 10.9.9.8 It must be changed to 255.255.255.0. The Default Gateway may be left blank, as well as the Preferred and Alternate DNS servers. That is all you need to do for the static IP address. 2. You can try running Mach at this point, but you might need to disable the firewall if it doesn't communicate. When you run Mach, a firewall warning might pop up that says an application is trying to access the Internet. Give it permission to do so. It needs to be valid for Public networks and not just Home or work (private) networks. That way you won't need to disable the Firewall because you are creating an exception for Mach. Depending upon whether or not the user has previously checked off the box that says "Don't ask me again" when you select a motion control device, you might need to reset that. In order to do that you will need to have Mach running (which means you will need to be pretending to be running another device such as the parallel port). Choose the pull-down menu "Function Cfg's". Then choose the option "Reset Device Sel...". The next time you run Mach it will ask you which motion control device you want to run. CTftp::WakeupClient Board does not reply. Click No, and then you will be allowed to enter the Static IP address of the SmoothStepper board (10.9.9.9). You will only need to do this once, since the next time Mach runs, it will find it in the XML file when it starts.